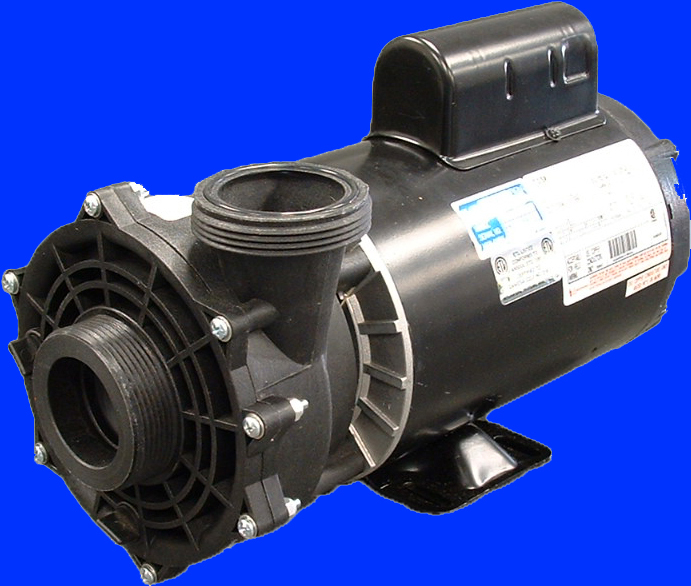 Replacement Santa Barbara Spas Control for $299.95 Free Freight Mfg Direct Why Pay Retail! 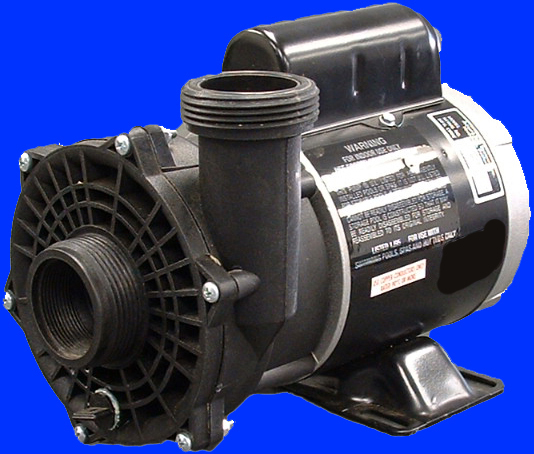 Free advice how to replace your existing Santa Barbara Spas control and heater. 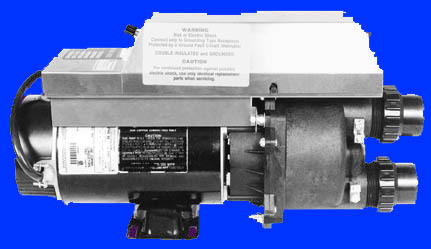 The Universal Spa Control (USC) is a direct replacement for the spa controls sold by Santa Barbara Spas. Fits all Santa Barbara Spas! 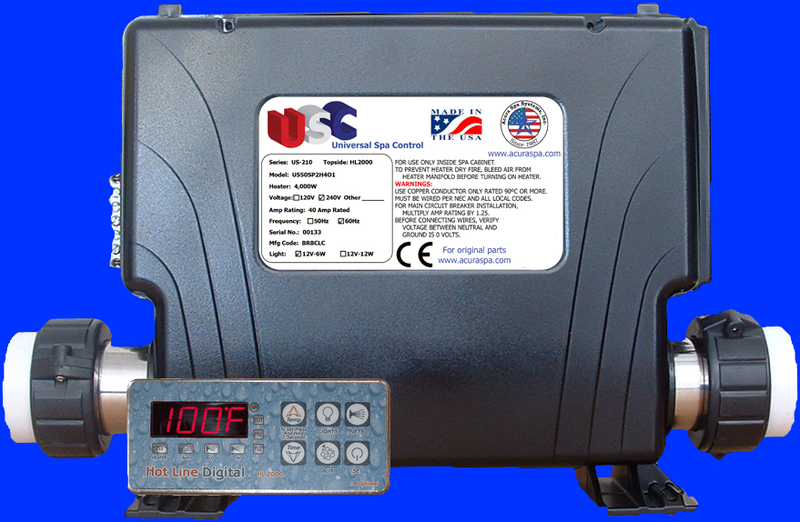 The Universal Spa Control (USC) for $299.00 is a reliable spa control that fits all hot tubs and is a direct replacement for all spa brands. The USC spa pack is equipped with a 5500W (5.5kW), 4000W (4kW), or 3000W (3kW) spa heater. 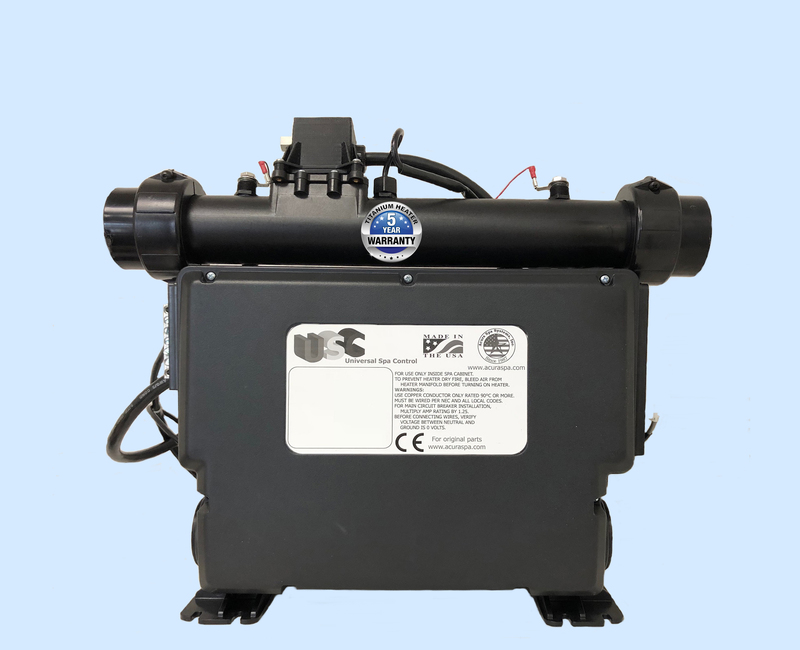 The USC hot tub heater is protected by a reliable pressure switch and two digital temperature sensors. Consumers can easily add to their existing spa plumbing our patented Automatic Air Bleeder to 100% protect the USC spa heater from dry fire. 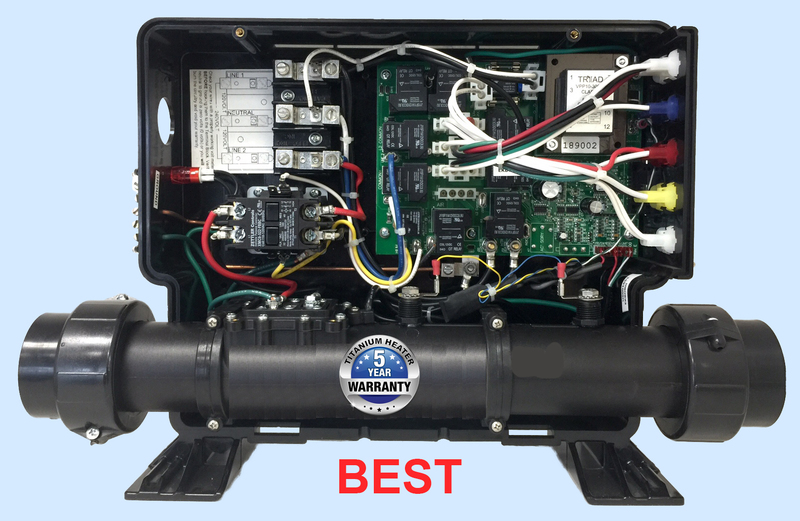 The USC hot tub pack is also equipped with a heavy duty contactor outside of the digital control board to drive the USC spa heater. All of our spa digital control boards are conformably coated to protect the electronic circuitry against the moisture inside portable spa cabinets. Our digital spa circuit boards are 100% made in the USA. Our USC control board can operate up to 4 water pumps and our smart touch spa side controller is made with reliable membrane switch technology used for years in the aerospace industry. 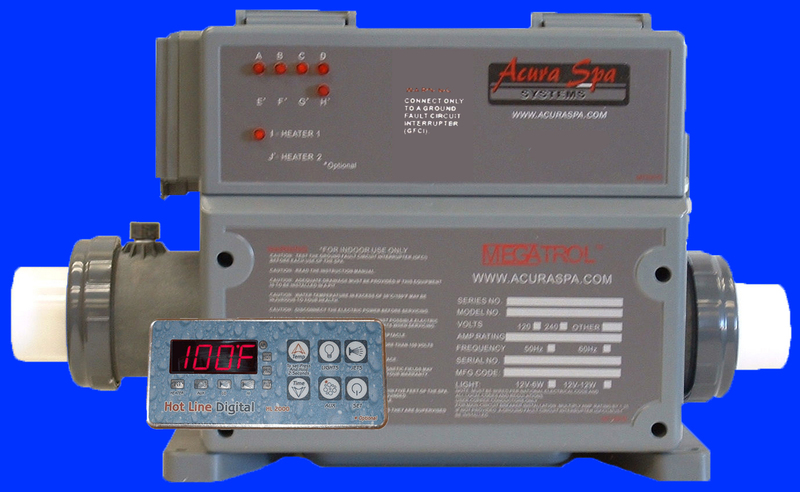 Our energy efficient digital spa controller turns the heater on only when necessary, thus saving hot tub owners hundreds of dollars per year on their electrical bill. In addition, our digital spa controller contains Freeze Guard to prevent your hot tub freezing and costing thousands in repairs. 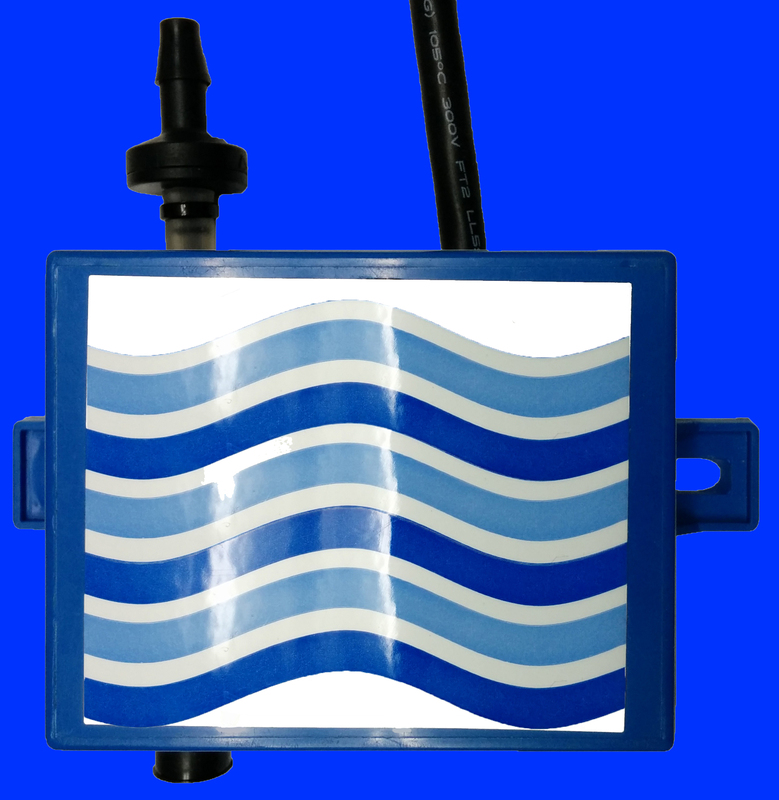 We also incorporate Hi-Limit Sensor to protect your spa from overheating (and saving your pumps and plumbing). The Universal Spa Control can power spas and hot tubs all over the world with 120V, 60Hz and 240V, 50Hz single or three phase power. The USC can replace all Balboa spa controls, even the balboa hot tub control with M7 technology. 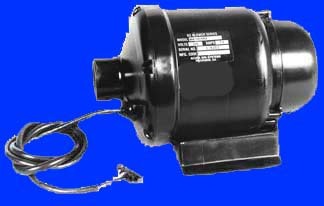 If your hot tub is powered by a Balboa water Group heater, call us we can make you a replacement. Some spa manufactures use Gecko spa controls or even Spa Builders controls, call us for a replacement. 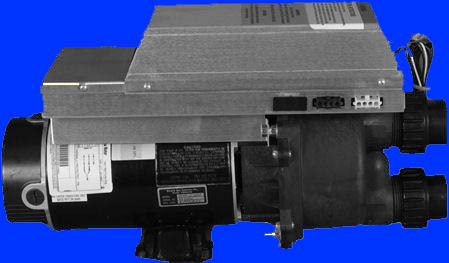 We offer direct replacement to all controls made by ACC spa packs also known as Applied Computer Controls, smart touch 1000, smart touch 1500 or smart touch 2000.We can build equivalent heater to United Spas controls, Waterway digital controls are using the same polymer enclosure as the USC. We can also make you a control to replace Brett Aqualine and Catalina controls or Even CRL spa pack. spa manufacturers do not make controls or hetaer they purchase them from spa pack mfg. is any of the following spa manufacture, the USC can power and control your hot tub. Alp Spas, Affordable Spas, Action Spas, Hot Spring Spas, Sundance Spas, Vita Spas, Maax Spas, Saratoga Spas, Clear Water Spas, Caldera Spas, LA Spas, Dolphin Spas, Diamante spas, Sensation Spas, PDC Spas, Hawkeye Spas, Morgan Spas, US Spas, Cal Spas, Advanced Spa Designs, Thermospas, Aquamonde Spas, Aquamonde Hot Tub, Free Flow Spas, Viking Spas, Sweetwater Spas, Aspen Spas, Nordic Spas, Apollo Spas, United Spas, Life Spas, True Force Spas, Country Leisure Manufacturing, Catalina Spas, Caribbean Spas, Curtis Spas, Santa Barbara Spas, Spa Manufacturers, Atlas Spa, Pacific Marquis, Beachcomber, Aris Spas, Tuff Spas, Sun Ray Spas, Leisure Bay Spas, Master Spas, Blue Ridge by Jacuzzi, South West Industries, BullFrog Spas, Sunset Spas, Paradise Spas, Turbo spas, Spa and Tub Manufacturer, Sunquest Spas, Spa Crest, Spas by Design, Spa Plus, QCA Spas, South Pacific Spas, Anton Spas, Charisma Spas, Sunrise Spas, Bahamas Spas, Santa Barbara Spas, Safari Spas, Bradford Spas, US Spas, Four Wind Spas, Millennium Spas, Seaside Spas, Icon Spas, Keys Backyards, Hot Tub Factory, Gulf Cost Spas, Gatsby spas, Emerald Spas, Blue Falls Mfg, Aber Hot Tubs, Aqua Mystique Spas, Aqua 4 Fun Spas, Aquamarine Spas, Tiger River Spas, Aquatique Industries, Australian Spas, Baja Spas, Blue Water Spas, Classic Spas, Clipper Spa Manufacturer, Clear Water Spas, Caldera Spas, Watking Spa Manufacture, Hot Spring Spas, Royal Spas, La-Z-Boy Spas, Fort Wayne Spas, Esther William Spas, Coast Spas, Water Edge Spas, Cal Spas, Cal Spa, Rio Swim Spas, Diamond Back Spas, Pacific Pool and Spas, Artesian Spas, Izzi Manufactuing, Jacuzzi, Seven Seas Spa, Monalisa Spas, California Cooperage Spas, Coleman Spas, Caldera Spas, Swim Spa Manufacturers, Strong Spas, Aries Spas, Artic Spas, Roberts Hot Tub, Alp Spas/Associated Leisure Products, Bullfrog Spas, Carribbean Spas, Country Leisure Spas, Curtis Spas, D. M. Industries, Dakota Spas, Diamonte Spas/Sensation Spas, Dimension One Spas, Dolphin Spas, Goodlife Spas, Grecian Spas, Hawkeye Spas, Islander Spas, ITT Industries/HydroAir (Europe), Jetpool (Brazil), Leisure Spas/Sedona Spas, Life Spas, Lifespring Spas, Marathon Spas, Mountain Springs Spas, Orozco International Spas, Pacific Fiberglass, Pacific Pool and Spas (Canada), Phoenix Spas, Platinum Spas, Seacard Pool and Spas, Sequoia Spas, Sunbelt Spas, Sunquest, ThermoSpas, US Tooling Spas, United Super Spas, Vortex Whirlpool Systems, Inc. and many others. 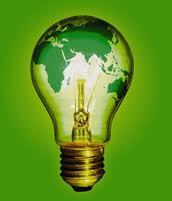 Spa manufacture submit their spas for testing under UL standard 1563 for US, CSA for Canada and CE for Europe. 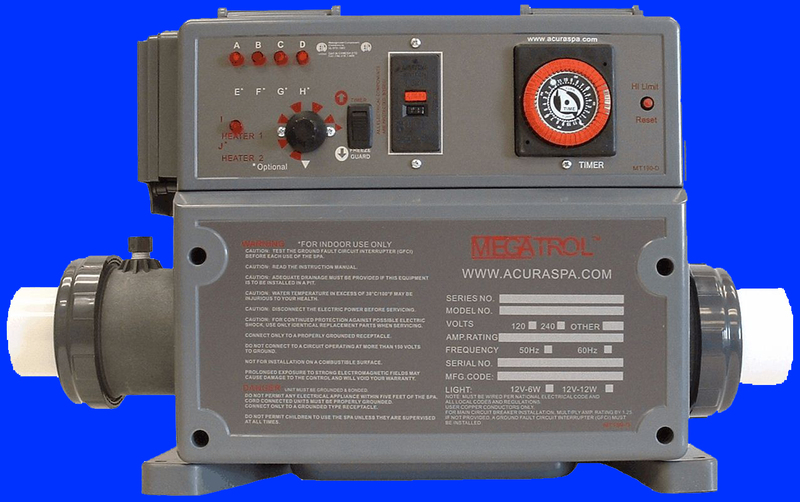 Acura Spa Systems can rejuvenate your old Santa Barbara Spas with new reliable control, heater and pump manufacturer direct, free freight with no middleman! Call us today for free advice on how to retrofit your existing control and heater in Santa Barbara Spas with our energy efficient digital control. 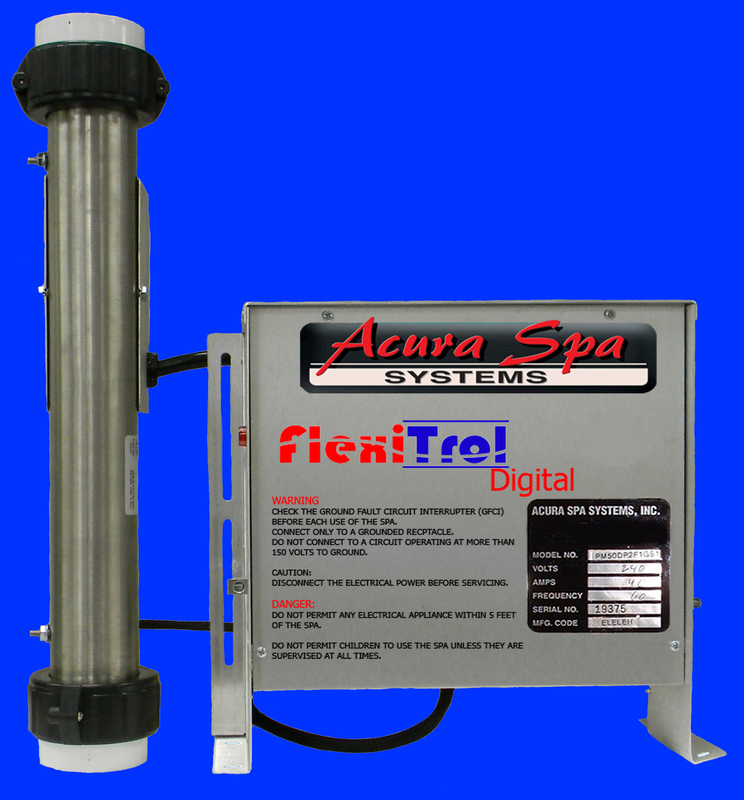 Our patented Megatrol Titanium Heater is 100% submerged in the spa water and comes with 5 years no-fault warranty. 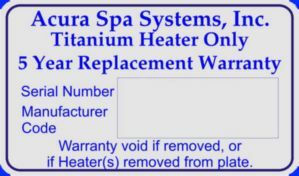 Our knowledgeable spa technicians can get you back in hot water so you can enjoy your old Santa Barbara Spas hot tub. Stop purchasing parts separately through local dealers and stop spending money on expensive spa repairs. 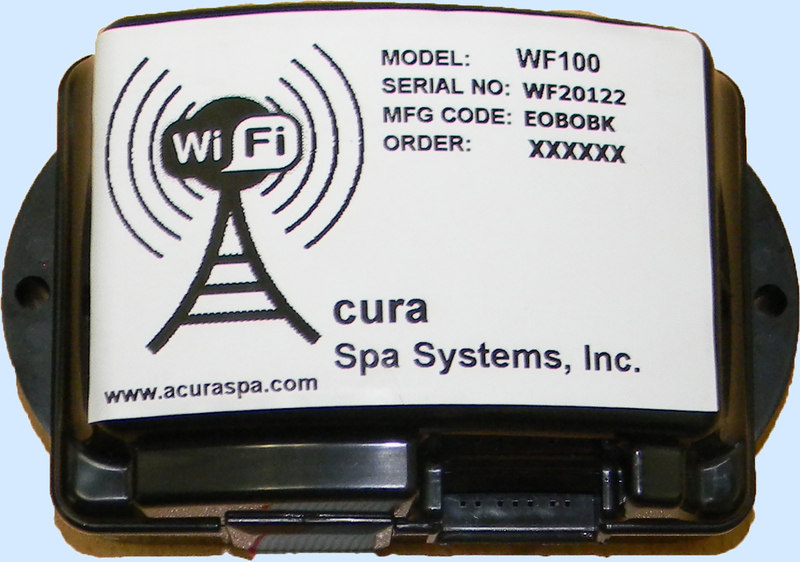 Simply change the complete control and heater and enjoy your rejuvenated Santa Barbara Spas with a new digital pack from Acura Spa Systems, Inc.
We can properly control your Santa Barbara Spas hot tub.